The Crystal Gem Contemporary gas fire with remote control is the perfect gas fire choice for those who want great looks and fuel efficiency as well as easy operation and low maintenance. 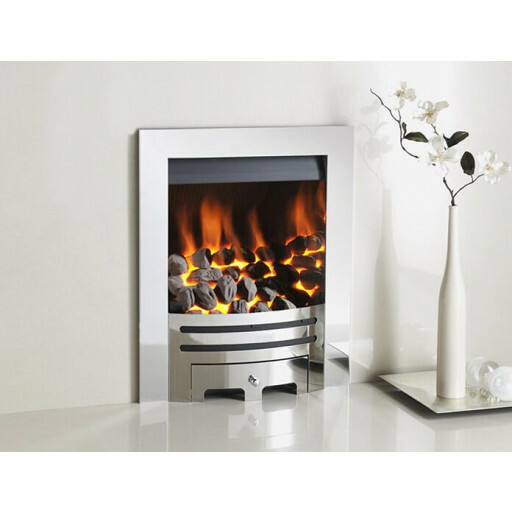 The Crystal Gem Contemporary gas fire has been crafted as an open fronted gas fire featuring a realistic looking bed of coals, accented by a polished chrome trim system that is both sleek and contemporary. Proudly produced in the UK by Crystal Fires, the Chrystal Gem Contemporary gas fire is fully remote controlled for the ultimate in convenience. It has been designed to fit any Class 1 or Class 2 chimney that offers a 16" x 22" inset fireplace opening. This is a contemporary model that is also affordable to operate on a daily basis, featuring 61-70% fuel efficiency and a cosy heat output of 4.1kw to 5kw that makes any room in the house feel comfortable and more inviting. Operating this handsomely crafted quality Crystal Gem Contemporary gas fire requires none of the tending and clean-up associated with traditional solid fuel burning fire. Yet it provides an energy efficient source of heat that is easy to use, doesn't take up much space, and is trouble-free to maintain.